ArcGIS Server content can be added to ArcMap (as well as ArcGlobe) as map layers. There are a number of ways you can add ArcGIS map services to your map, which are described here. In the Look in list, choose GIS Servers to see a list of servers you have previously used. If you don't see the server you want, use Add ArcGIS Server to connect to a GIS server. Once connected to ArcGIS Desktop, map services are listed in the Add Data dialog box using the GIS service icon . Choose the map service you want to add. The service is added as a layer. Connect to ArcGIS Server in the Catalog window. Choose a map service and drag it into your map canvas. Within your map canvas, your pointer changes . You can successfully add your map service with this pointer. Click File > ArcGIS Online. A dialog box appears. Choose the desired ArcGIS map or image service from the dialog box. 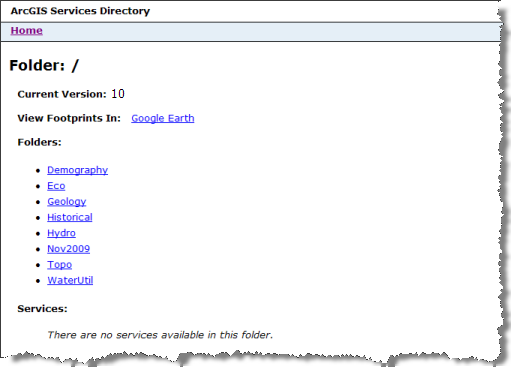 Connect to Services Directory. In a web browser, type the URL http://<server name>/arcgis/rest/services. You see either a list of folders, a set of services, or both. You can use a URL shortcut by typing http://<server.name>/arcgis/rest. Navigate to the desired map service. 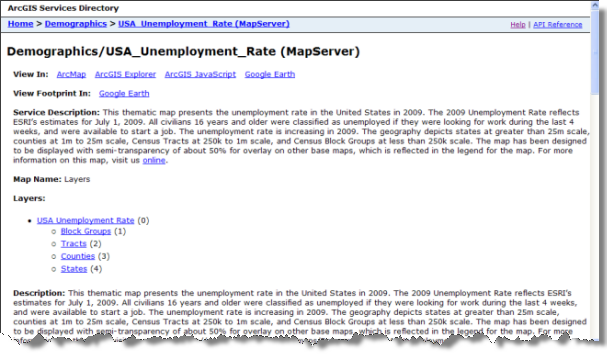 A web page similar to the Demographics service description page above is displayed for each service. Click the View in: ArcMap link to add the service as a layer in ArcMap.